Learn how to grow, propagate and use Eucalypts! Eucalypts are primarily natives of Australia, but have been cultivated widely around the world, from the tropics to cool temperate areas and from very wet to very dry climates. This is a comprehensive foundation course on the genus Eucalyptus, covering identification, culture (propagation, soils, landscape uses, feeding), and uses. Throughout the course you build both a knowledge of the group as a whole, and of the range of species you can identify. “They are not just ‘Gum trees’ as they are known in Australia. They are an important part of the natural landscape and grow all over the world. Learn all about this Aussie Icon from the experts.” - Tracey Morris Dip. Hort., Cert. Hort., Cert III Organic Farming, ACS Tutor. Culture - Planting, staking, mulching, watering, pest & disease, feeding, pruning, protection from wind, salt air, etc. Propagation - Methods of propagating this group of plants. and the differences between the many species that are or were once in the genus Eucalyptus. There are around 800 species of Eucalyptus known to exist, and acknowledged by at least some experts; although the overall classification and naming of Eucalyptus species has been, and continues to be uncertain. Not all experts agree. Note: the operculum on a eucalypt flower bus detaches as the flower opens. You may differentiate angophoras from eucalypts by the presence of large numbers of bud caps on the ground, under a tree, when it is flowering. In 1934 W. F. Blakely (from the Sydney Royal Botanic Gardens), classified Eucalyptus into 606 different species and varieties. In 1971, L.D. Pryor and L.A.S. Johnson revised Blakely’s classification and divided the genus into seven sub genera. This work was not formally published though. Some authorities accepted these seven sub genera, while others acknowledged more than seven; and up to thirteen. Up to six of these 13 sub genera are represented by only one species each; and as such are not particularly significant across the entire genus. 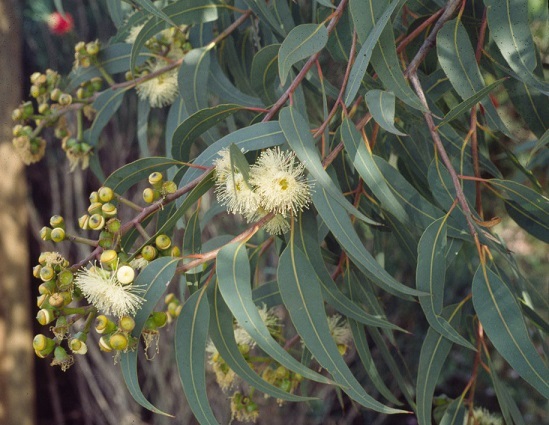 In more recent times there has been a move to split the genus Eucalyptus into two or more genera; most remaining as Eucalyptus, but a significant number divided off. These are the Bloodwoods (eg. E. calophylla, E. ficifolia, E. citriodora, E. maculata). Taxonomists declared this a separate genus in the 1990's, but that decision was later challenged and reversed, only to be reversed again. Understandably, some people may still use the name Eucalyptus while others use the name Corymbia. Many authorities now consider these to be the genus Corymbia; though others may still call them Eucalyptus. Blakella These are the Ghost Gums. They have tessellated bark (eg. E. tesselaris). Many authorities now consider them to be the genus Corymbia. Some consider them to be another genus “Blakella”; and yet other may still consider them to be Eucalyptus.